Do you like Supermuzhik 2? Share it with your friends. Supermuzhik 2 is the second part of a fabulous reminders flash with popular pixel graphics featuring fifteen brand new levels and a total of three powerful bosses. 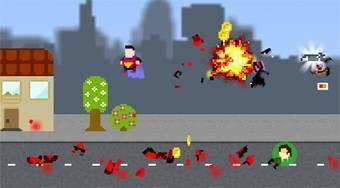 In each round fly as a super hero over the city, use the laser beam to catch civilians on the ground and use them as a weapon to destroy enemies in the air and on the ground.